Recorded at Array Space, October 18, 2017. 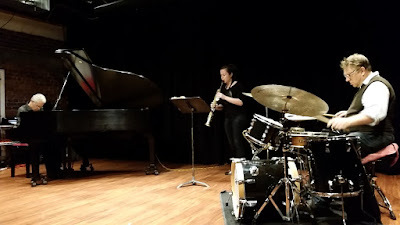 A night of celebration for the Entangled Pathways album, this trio moved easily between through-composed and more loosely structured pieces as well as some guided duo improvisations and the "open" encounter leading off here. That's fitting as these three first connected through the Toronto Improvisors Orchestra. The night featured most of the album's pieces over two sets, ranging from stately textures to choppier sonic waters, with extended techniques from all three wending their way into the music.